Hi everyone! Hope you are doing well. We've been enjoying longer days and blue skies, at least some of the time. It's been spring break this week and we've visited an airplane museum and gone to see the locks in Seattle too. We were lucky to have my husband's parents and sister visit us for a few days, it's sad to see them leave. And even had sunlight for taking some pictures. Maybe this photo's a little too bright but I like it anyway. We waited so long for sunny days this winter. 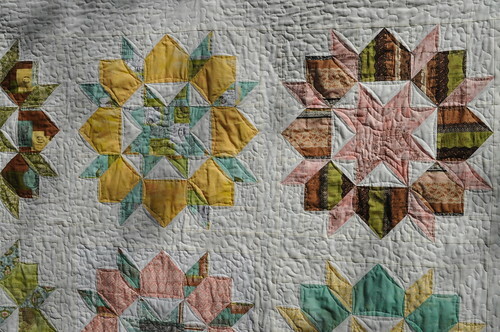 *I used Basic Grey's Curio fabric collection for the blocks and a JoAnn's quilter's only solid for the background. 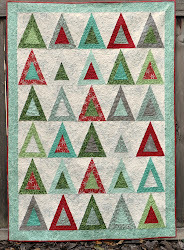 I am disappointed because the quality of the quilter's only solid has really gone down since I last bought some, probably a couple years ago. It has a much looser weave and lower thread count, and I won't be using it again. *Blocks are 18". 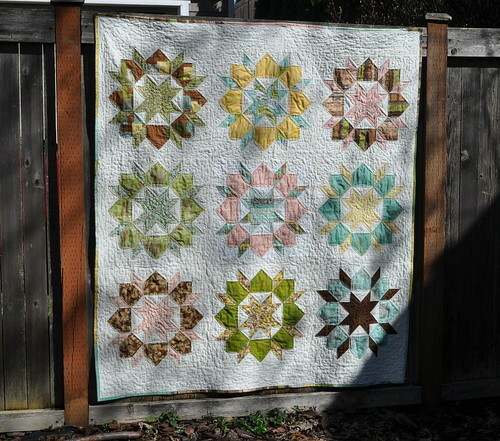 The finished quilt is around 62" x 68".